P.R.I.C.E. hours are “Parent Required Involvement in Christian Education.” Each school family in the K-8 program is required to contribute 25 hours of volunteer service to Trinity Lutheran School during the school year, CDC families are encouraged to do so as well. Hours can be earned by parents/guardians, the student themselves, or other family members. This volunteer service commitment ensures the much needed parental involvement of all Trinity families toward our many events, fundraisers, field trips, classroom activities and more. There are numerous opportunities throughout the year and we look forward to working beside you to make this a successful year at Trinity! Without that valuable investment of time and talent from our Trinity families we would not be able to make it all happen. It is amazing what can be done when we all pull together and pitch in some time and effort! Logging P.R.I.C.E. Hours – now online in your ParentsWeb account! 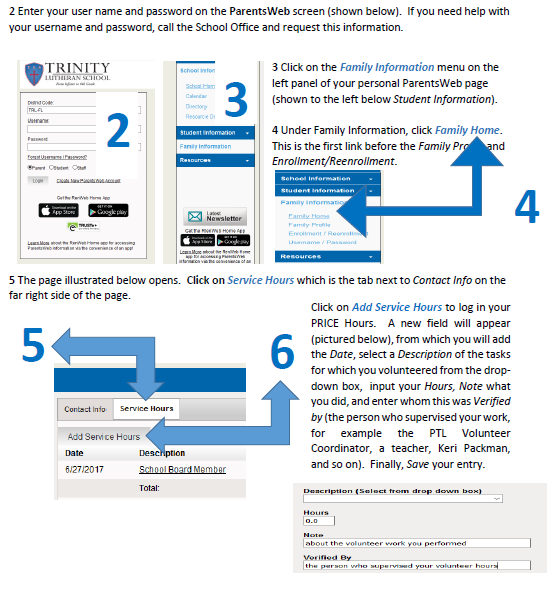 1 To access ParentsWeb, click on the ParentsWeb button from the school website Main Page, Parent Resources page, or the button seen here to the right. 2 Enter your user name and password on the ParentsWeb screen. If you need help with your username and password, call the School Office and request this information. 3 Click on the Family Information menu on the left panel of your personal ParentsWeb page (shown to the left below Student Information). 4 Under Family Information, click Family Home. This is the first link before the Family Profile and Enrollment/Reenrollment. 6 Click on Add Service Hours to log in your PRICE Hours. A new field will appear (pictured below), from which you will add the Date, select a Description of the tasks for which you volunteered from the drop-down box, input your Hours, Note what you did, and enter whom this was Verified by (the person who supervised your work, for example the PTL Volunteer Coordinator, a teacher, Keri Packman, and so on). Finally, Save your entry.